It’s been a few months since the launch of Apple Watch and developers are still exploring the technology it beholds and how it can be further evaluated. Alongside the evaluation, Apple launched the WatchOS 2 which brought quite noticeable changes in the operating system of the wearable. 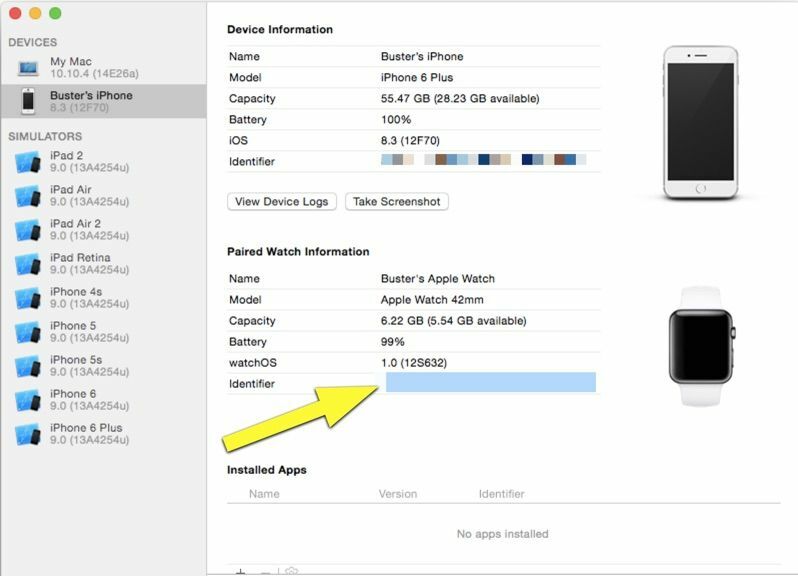 However, some developers seemed to find a need for a UDID of the Apple Watch to connect other kinds of data to the device. For those who are unfamiliar with UDID or Unique Device Identifier, it is a set of 40 sequenced alphanumerics specifically associated to your device. It is a kind of serial number that belongs to your device alone. However, due to its complexity its quite harder to guess. It can be something like this: 8f0c7c2404d131be2e1930235k5664034b831189. The first question that pops in mind of a random user is the purpose of a UDID. To be precise, the UDID is used to connect different kinds of data to the host device. Every different iPhone or iPod possess a unique device identifier (UDID). You can use the UDID to connect to an iOS Developer Account which aids in installing apps for testing purposes. Henceforth, UDID hold an immense importance for a developer and the tester. Today, we are going to show you how you can find the UDID for your Apple Watch. Its comparatively easy to find UDID of your iPhone or iPad than the Apple Watch because you can directly use iTunes’ summary page. You need to have an addition software (Xcode) to find Apple Watch’s UDID. So we’re gonna show you how you can do that. Make sure your Apple Watch is paired to your iPhone, and your iPhone must be further connected to your Mac via USB cable. Follow the step by step instructions below. First you need to Download Xcode from the Mac App Store. Launch Xcode and Click Window and then Devices in the menu bar. In the Devices side bar, click on your iPhone. You will see all of you Apple Watch details and information under the Paired Watch Information title. You can find the UDID for your Apple Watch adjacent to the Identifier Field. Right Click to copy it. There are many reasons why you could need a UDID for your Apple Watch. You can gain access to the pre-release applications for testing purposes. We know many of you were not aware of the Apple Watch UDID, however now seems to be the right time as WatchOS 2 beta 4 has been released and native Apple Watch apps are on the way. Let us know in the comments if you found this helpful. The post Here’s How You Can Find Your Apple Watch UDID by Ali Salman appeared first on WCCFtech. Next article15 Useful Light Designs for You.